In recent years, forensics 3D printing has increased usage in the forensics and law enforcement fields due to more economically-priced printers, lasers, and scanners. Additionally, the seemingly infinite printing possibilities and uses in these fields have led to greater adoption of this technology. 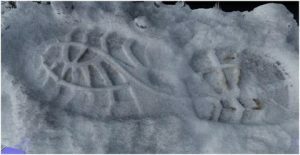 Historically, law enforcement and court officials have relied heavily on the physical evidence captured from a crime scene. During the process of logging, analyzing, and cataloging evidence, materials may succumb to degradation. In an effort to better preserve physical evidence, forensic analysts and technicians are beginning to use forensics 3D printing to create exact replicas of the evidence. This allows investigators to conduct greater analysis and testing on the evidence without disrupting the original material. 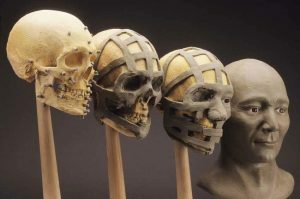 Cold case investigators in particular are using forensics 3D printing to replicate the skulls of unidentified persons so that forensic artists can reconstruct facial features in an attempt to correctly identify the person. 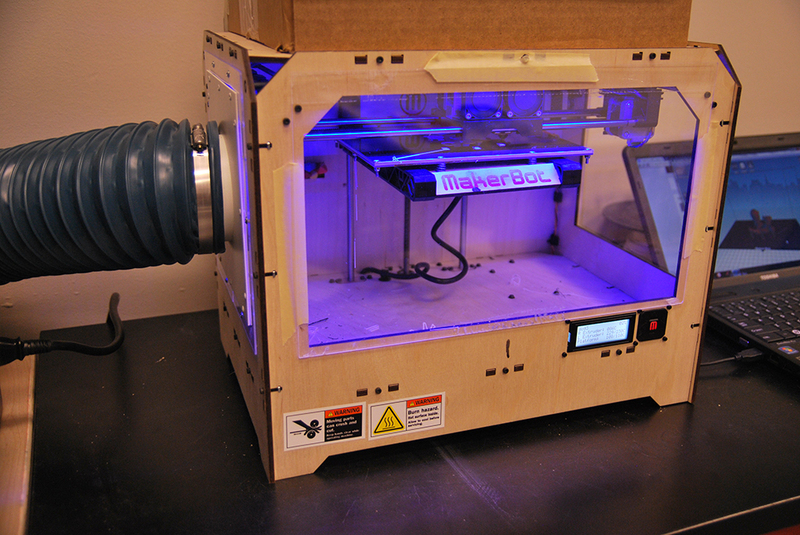 During the forensic 3D printing process, heat is applied to the filament in order to break it down. This breakdown creates ultrafine particles (UFP) and fumes which poses a health risk if inhaled. For example, ABS contains styrene which may polymerize when subjected to heat. According to the CDC-NIOSH website, styrene exposure can target the eyes, skin, respiratory system, central nervous system, liver, and reproductive system. Whether plastic, metal, wood, or ceramic-based filament, the forensic 3D printing process of applying heat to a material for breakdown will result in harmful particulate and fume emission to the operator. Furthermore, once an object has finished printing, rough edges, blemishes, and extra material may need to be sanded and polished before final cleaning takes place. These processes generate a plume of fine dust while cleaning solvents, such as isopropyl alcohol, emit noxious odors; both of which pose respiratory hazards to the operator. 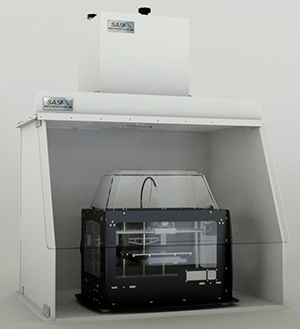 Sentry Air Systems offers several options for forensics 3D printing fume containment. Below are some of our most popular configurations. Depending on the scale of your printing operation, as well as any chemicals or solvents you may use, you may benefit from one or more of these units. All of our negative-pressure units utilize a powerful fan to draw air away from the operator’s breathing zone and into the filter chamber. Our HEPA filters are designed to capture 99.97% of dust and particulate down to 0.3 microns while our Activated Carbon filters and Specialty-blended Carbon Filters work to adsorb chemical and solvent fumes. Uses: Install the hose directly on the exhaust or side panel of a 3D printer for immediate source-capture containment and filtration. 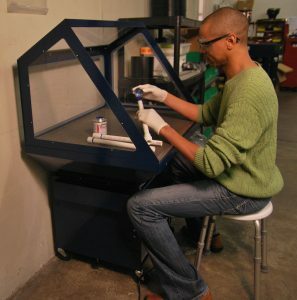 This forensics 3D printing fume control solution would work for both large and small 3D printing systems. Features: Negative-pressure enclosure with HEPA filter chamber, Variable Speed Control knob and Fluorescent Light. A variety of widths are available as well as customized features including transparent walls for increased visibility. Uses: Place the 3D printer directly inside the hood for greater containment and filtration of fume and particulate. This forensics 3D printing fume control solution would work best for smaller systems and provides containment of the fumes and particulates. Features: Chair-height, negative-pressure worktable with HEPA and/or Activated Carbon filter, lockable casters, solid or clear wall surround, available in a standing height. Uses: Excellent solution for ultra-fine particles, chemical and solvent fume control when polishing, sanding, and finishing 3D printed objects. This system pulls the particulates or fumes away from the operator providing health and environmental protection. For more information on 3D Printing Fumes or Fume Control Solutions for Forensics Applications, please contact Sentry Air Systems at 1-800-799-4609, sales@sentryair.com, or visit our website www.sentryair.com.